Col. Mike Escudie of the United States Central Command at MacDill AFB in Tampa looked out at the packed, newly renamed Veterans Theater at the Kings Point North Clubhouse on Monday and commented that he wasn’t sure if he had ever been in a room with so many veterans. 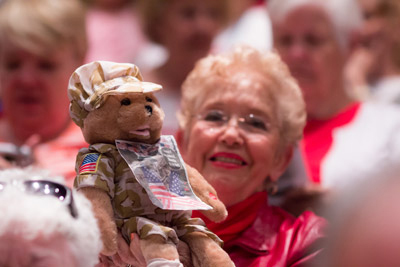 Indeed, it was standing room only as veterans from World War II, Korea, Vietnam and the Gulf wars, along with Americans of all walks, came to remember and honor those who served, and, specifically, those who gave all for their nation — either in battle or after. 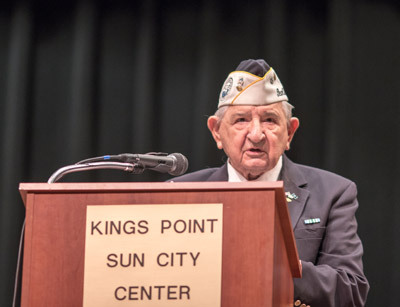 Among other things, Col. Escudie spoke of the need for young people to learn from and benefit from the experiences of the veterans, so that their missions, their sacrifices, their honor and their knowledge would never be forgotten. 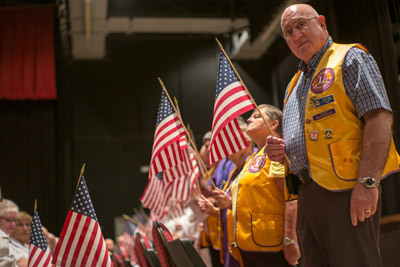 Standing for the fallen: As the names of the community’s fallen veterans were read for the 2015 ceremony, family members, friends and honorees stood in honor at each name. Mitch Traphagen photos. The Grand Marshal for the event was Col. Roy Conklin (USA-Ret), and the music was provided by the Trinity Baptist Church Choir, directed by Rev. 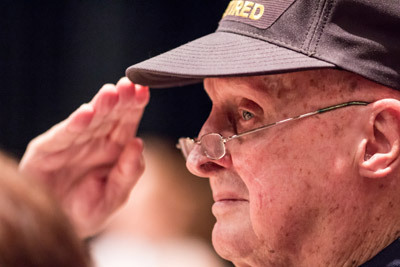 James Feist, a U.S. Air Force veteran, who also played taps. The colors were presented by the East Bay High School JROTC Color Guard. Rosemary Clifton (USN-vet), Lt. Col. Gordon Basset (USAF-Ret), Lt. Col. Julian Graham (USA-Ret) and Cmdr. Ed Socha (USN-Ret) read the roll call of those lost since last year’s ceremony. The wreath was carried to the half-staff U.S. 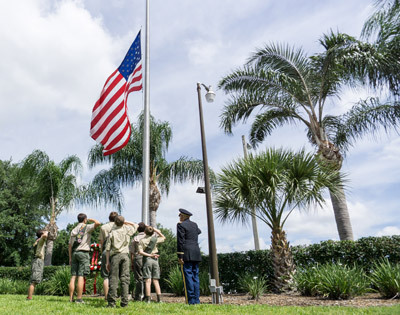 Flag by Boy Scout Troop 661. 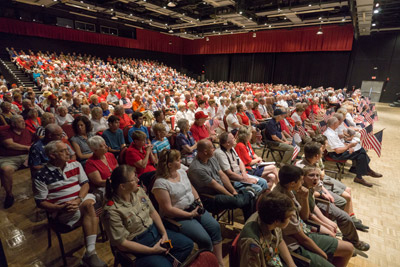 It was standing room only in the newly renamed Veterans Theater in Kings Point. The theater, formerly Borini Theatre, had been renamed shortly before the ceremony. 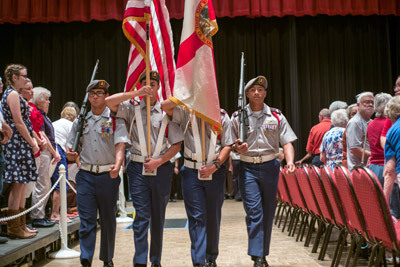 The East Bay High School JROTC Color Guard presented the colors during the opening of the ceremony. 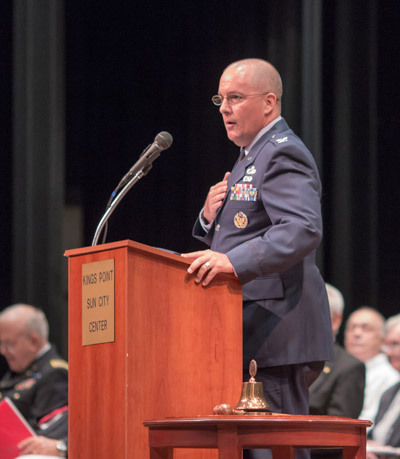 Keynote speaker Col. Mike Escudie of the U.S. Central Command at MacDill AFB spoke of the need for young people to learn from the older generations before it is too late. Cmdr. Edward Socha (USN-Ret), reads the names of the fallen during the ceremony. 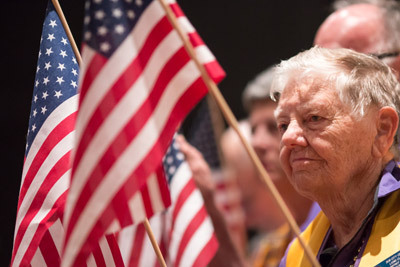 Socha is a Pearl Harbor survivor. Elijah Council, Robert Leonard, Connor Mortus, Corey Savidge, Bradley Clay and Mathew Leonard of Boy Scout Troop 661 with Grand Marshal Col. Roy Conklin (Ret) during the placement of the wreath. The wreath was courtesy of Sun City Center Funeral Home.